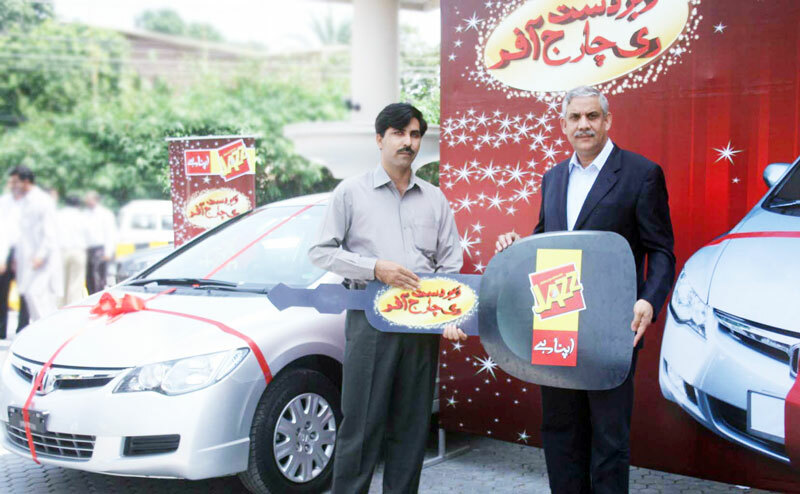 Irfan Akram, Vice President Customer Care, Mobilink presenting Muhammad Ihsan Ul Haq, one of the winners of the Jazz Zabardast Recharge offer, the keys of the 1,800 cc car. Mobilink presented the 6 lucky winners of the Jazz “Zabardast Recharge Offer” with three 1,800 cc cars and three air-tickets to any global destination of their choice. Mobilink Jazz launched the Zabardast Recharge Offer in June 2010 to offer the opportunity to win thousands of free minutes and free SMS bundles to its customers. Offer included a lucky draw where the winners could get high-valued prizes including 1800 cc cars and air tickets to any global destination. The offer concluded earlier this month. The winners of 1,800 cc cars were Rizwan Anjum from Khanewal, Muhammad Ihsan ul Haq from Rahim Yar Khan and Ashfaque Ahmed from Mehrab pur. The winners of air-tickets to any destination of choice included Abdul Hanan Khan from Narowal, Sifat Allah from Lahore and Farooq Ahmed from Karachi. The prizes were handed over to the winners in ceremonies held in Lahore and Karachi. Ohhhh…. phir aam adami. from Khanewal, Rahim Yar Khan and Mehrab pur. I never heard and watched any person lived in major cities and won the prizes from telecom industries…..
dats the catch my dear. Never forget that its a country called Pakistan. irfan akram,rashid khan all crap! it,s all a decieve to pakistani people,s.and i hope pakistani people,s will understand that this is a fraud.but i know pakistani people,s are fools.now i,m speak in urdu.yeh sab fraud hai or pakistani logon kay sath dokha h raha hai.pakistani log lalchi ho jatay hain. arfan sab kashmir ka kya socha.ya stand kar ga to boath muskal ho gay ga, department tranfer hona sa wada khatam ho gaya kaya. CS wala gift nahi data. i don’t belive that it’s a Fraud! the offer is compeletely Guinune! you can’t imagine how much they earn in these Scheme. that’s not a Big deal for them! A man living in lodhran win a honda city by Mobilink. he collected the car after a long period! Becuase he was afraid of fraud people!